ORLANDO, FL (September 19, 2018) – More than 70 female executives from the hospitality and meetings industry joined Associated Luxury Hotels International (ALHI) for its 13th Annual Executive Women in Leadership (EWIL) Conference on July 26-28, 2018 at The Meritage Resort &Spa | Vista Collina Resort in Napa Valley, CA. Co-hosted by Delta Air Lines Inc. and The Meritage Resort & Spa | Vista Collina Resort, the conference is an opportunity for executive women leaders in the meetings and hospitality industry to gather together for an exclusive chance to share ideas, grow professionally and network among their peers. The program features a combination of unique business sessions, which provides attendees with actionable ideas and valuable insights to map their business strategy for the future. The conference created a unique setting for the group of high-powered executives to disconnect for the weekend, network, exchange ideas and share more personal dialogue around maintaining a work-life balance. 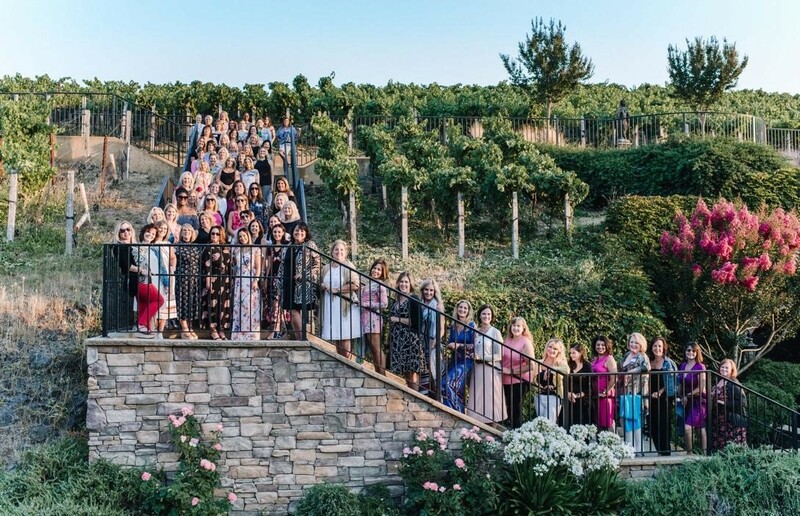 The weekend’s activities included discussion sessions by keynote speakers, spa appointments, sunrise yoga and meditation, and a winemaker’s dining experience. Chief Wellness Officer of Evolution Hospitality and professional speaker Dr. Romie Mushtaq,one of the keynote speakers, shared cutting edge research on mindfulness and tools for improving personal focus. Pictured are the coordinators of this year’s conference (from left): Sheri Thomas, The Meritage Resort& Spa Area Director of Sales; Amber Voelker, ALHI Regional Vice President for the West; Vicky Hettleman, ALHI Senior Vice President Sales; Ashly Balding, ALHI Executive VicePresident; Gerry Kinsington, Delta Air Lines Inc. Meeting &Incentive Sales Manager; Elaine Morena, ALHI Regional Vice President for the Northeast; and Stacy Lucherini, ALHI Senior Vice President of Sales. ALHI Meeting& Incentive Collection is an industry-leading global sales organization focused on the Meeting, Incentive, Convention and Exhibition market (MICE). The company serves as the global sales force for a highly selective membership of more than 250 luxury hotels, independent luxury hotel brands, luxury cruise ships, and Destination Management Companies (DMCs) and operates 25 sales offices across North & South America, Canada, Germany, and the United Kingdom.For more information, visit www.alhi.com. For more information about ALHI and/or its member hotels and resorts, planners can contact their nearest ALHI Global Sales offices in North & South America,Canada, Germany, and the United Kingdom (25 offices in total). For specifics,go to www.alhi.com to identify the nearest ALHI Global Sales professional. Or, call the ALHI Group Desk toll-free in the U.S. at 866-303-ALHI (2544).